Thanks Greg. If I was closer I'd have been able to read the model # on the door. I learned to tell the difference with that little vent on the hood. It’s longer and curves down on the VNL. Can you tell if the trailer is from a new order too? Use your head, wear a helmet. I saw an ABF Kenworth T680 sleeper, brand new. The sleeper cab was huge, pulling a set of pups through west of Salina, Kansas on I-70. It could be from the looks of it. That’s very interesting. They discontinued the sleeper teams up in the PNW down to Cali but still had them running up there. I wonder if they are running more wild now and ended up down there. Or maybe ABF is trying sleepers in a different lane. Just confirmed with a driver they’ve been released into the system. Saw an A. Duie Pyle Volvo VNR sleeper a couple of days ago on I-495 in Virginia. Also spotted what looked to be a white Pitt Ohio Hino straight truck sitting in the Ocean View GSP rest area on a trip to Wildwood NJ this afternoon. Hi Charley. The white Hinos are non-CDL trucks. I’m not sure if the long-term plan but all of our latest newest straight trucks have 28’ x 13’6 bodies compared to 24’ or 26’ x 12’6 on the previous ones. I’m thinking the Hinos, along with the Sprinters, will be used in part to serve customers that are not accessible with the larger straight trucks. My terminal recently re-added a Sprinter to the fleet after going several years without one. NEMF just got more of those little cube straight trucks for similar purposes. I see Pyle has some also. Unit number appears to be NG2101. NG = natural gas? That’s correct. D=Diesel, S=Straight truck, NS=Non cdl Straight truck. T=Trailer, HT= Heated Trailer. An R suffix is used on rack trailers, while an L suffix is on liftgates. It’s a pretty straight frontward system but I still get a kick out of how they continue to ID the diesels in tractors. .........just think YRCs Volvos were probably celebrating their 15th birthday when this thread started. Silver Jubilee coming up soon. 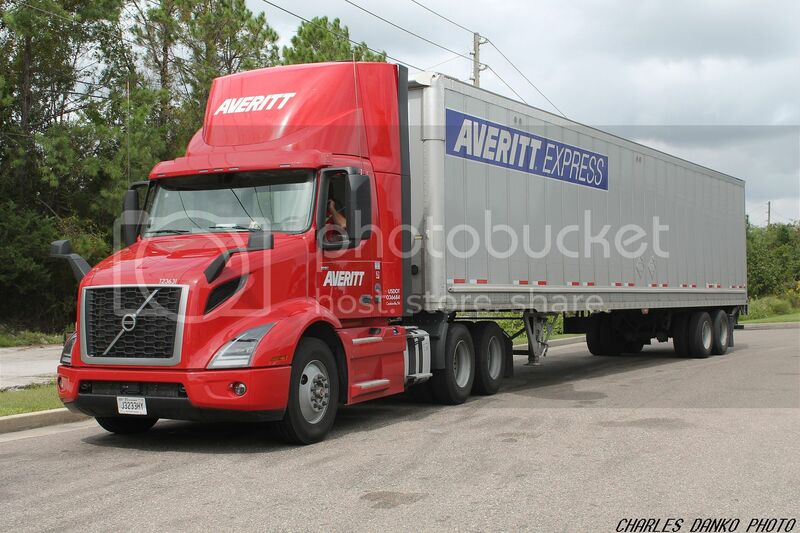 Averitt Express Volvo VNR ready to hit the road after making a delivery at the Petro in Kingsland GA on 10-7-18. Looks good, nice to see them keeping their red and grey livery.